The first result shocked everyone. GM Alex Stripunsky overlooked a simple capture on move 11 and resigned immediately against GM Alexander Onischuk. According to U.S. Championship statistical guru Ed Gonsalves, the game was the third shortest to produce a winner since the modern tournament began in 1936. Onischuk felt some of his playing partner's chagrin and was disappointed with the way he won. “We are really good friends, and I feel sorry for him,” Onischuk said. Several other players offered various possible reasons for the blunder, but at the end they were simply left guessing. Onischuk took a walk with Stripunsky afterward but could only speculate on whether Stripunsky could recover mentally. “It depends on the personality,” he said. “Some people will never recover.” The loss is particularly handicapping for Stripunsky, as he squanders one of the cherished opportunities with the white pieces. Onischuk's good fortune allowed him to be the only player to win as black in either championship. In other round one action, two of the younger players squared off. GM Alex Lenderman played the most attacking-minded game against GM Ray Robson. He got a pawn to f7 early, opened the file his opponent's king sat on, and jettisoned a piece into the foray to gain time for the whirlwind. Robson complicated the issue by walking his king to f6, an unexpected maneuver for Lenderman. “It's such an unusual idea,” Lenderman said. “I just didn't see it. I kind of underestimated it. “I was actually trying to steer the game away from dynamic complications, but Ray went for it, so I had to. I'm a little surprised I won this game.” Robson survived until the endgame, when Lenderman claimed he won by a single tempo. GMs Yury Shulman and Gregory Kaidanov played a see-saw affair that ended in the only draw of the championship. “I'm sure Yury was worse,” Kaidanov said. “I just couldn't find ...” and the end of his sentence was as elusive as the clinching move of the game. In the U.S. Women's Championship, reigning champion IM Anna Zatonskih began her title defense with a painless win over 17-year-old Alena Kats, who is playing in her first championship. Zatonskih had the classic dominant knight against an imprisoned bishop, and a stranglehold of both sides of the board. “She probably doesn't have experience in such positions,” Zatonskih said. IM Irina Krush, who since 2006 is the only other woman to win the event besides Zatonskih, kept pace with a convincing win over WGM Sabina Foisor. The two also played in the first round last year, when Krush survived an onslaught only to hang her queen and scramble later in the tournament to try to qualify for the finals. Besides getting off to a better start, Krush was particularly pleased with the planning that helped her win the game. “All these ideas I studied I actually got to use,” she said. “It was a product of all my work. The onus is on white when black plays ...g6 lines.” Krush liked her early a4 and was ready to push the pawn again to restrain the knight on d7. She gave back her surplus pawn at just the right moment, then in a better position found a knight retreat that forked Foisor's rook and bishop. She admitted that it took her a few minutes to find the elementary idea, but was completely satisfied with the quality of her play. IM Rusudan Goletiani came out of an equal middlegame to land a dominant queen in the center of the board. WGM Camilla Baginskaite could only wait, and Goletiani's kingside pawns marched up the board and then used her queen for an indefensible pin to net a piece and the game. Goletiani was rooted at her own board and was one of the few players who did not even know about the 11-move game in the U.S. Championship. “I guess I don't get as bored as other players,” she said. Round two begins tomorrow at 1 p.m. Central, 2 p.m. Eastern. 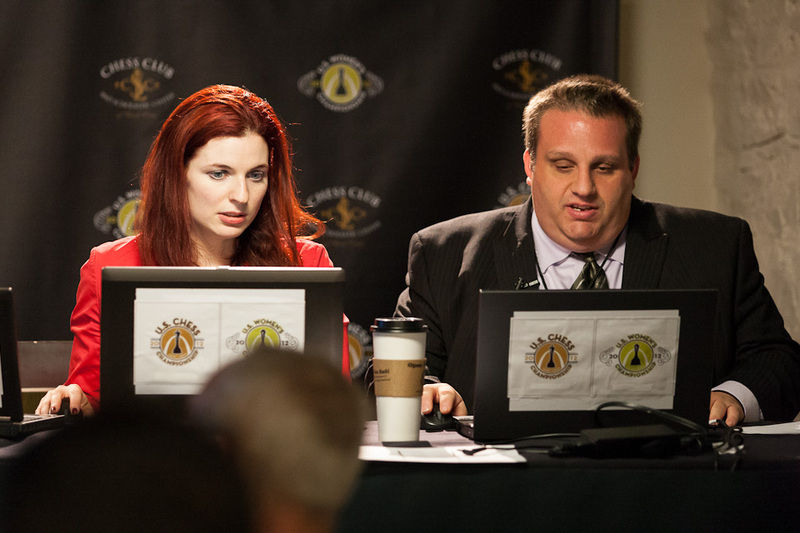 Tune in to www.uschesschamps.com for live commentary from Shahade and the club's GM-in-Residence, Ben Finegold. Pairings for round two can be found at www.uschesshcamps.com/standings-and-games.